Read on to find out why updating your bathroom cabinetry could be the perfect solution for your home. Even if you have a small bathroom, you’ll likely find that replacing your bathroom cabinetry gives you more storage space. That’s because modern innovations in bathroom cabinetry have replaced the typical space-wasting, double-door vanity with more functional options. Homeowners can now opt for open shelving, drawers, or a combination to create storage space that’s more suited to their needs. This means plenty of space for makeup, hair dryers, accessories, and toiletries that can quickly clutter the typical bathroom. Not only will you have more space to store these items, but you can organize them so they are easily accessible and simple to put away, keeping your bathroom tidy and uncluttered. Bathroom cabinetry can also extend beyond the typical vanity. For example, installing floor to ceiling shelving can also provide additional storage for toilet paper, extra shampoo and conditioner, towels, and other accessories. The best places for floor to ceiling shelving are behind the toilet or in the unused space behind the bathroom door. Modern medicine cabinets can also be custom-designed to provide more usable storage space that is right at your fingertips. Cluttered bathroom countertops present many challenges for homeowners. Not only is clutter unattractive. It can make you dread walking into the bathroom in the first place. If your bathroom countertop is currently housing baskets of accessories or a clutter of toothbrushes, new cabinetry can help you clean up your counter clutter for good. You may also opt for additional open shelving that can easily house frequently used items, off the counter and out of your way. The style of your cabinetry can make your bathroom look older than it actually is. Replacing it gives you the opportunity to change the look and feel of your bathroom right away. For example, you might decide to upgrade plain, standard styles to something more ornate. Or take advantage of modern design trends by adding wall-mounted, “floating” cabinetry for a more upscale look. Painted cabinetry is also a popular trend in bathroom cabinetry, replacing darker, wood designs with a fresh, open look and feel. Drawers and other types of shelving provide additional storage options, while adding texture and interest to the space. Finally, the addition of modern hardware, from drawer pulls to cabinet door handles, can take your space from frumpy to fabulous in a hurry. For some homeowners the challenges of their cabinetry go beyond simple aesthetics or even storage capacity. If you have missing or broken cabinetry, it’s probably detracting from your enjoyment of your bathroom on a daily basis. Many older homes also have bathrooms with poorly laid out cabinetry that gets in the way of traffic flow. Replacing your cabinetry can eliminate these problems, create better flow, and make it more enjoyable than ever to use your bathroom on a daily basis. Not sure how to modernize your design layout? At Red Rose Cabinetry, our expert design staff specializes in helping homeowners improve traffic flow and make better use of their available space. Just schedule a free design consultation to get started! 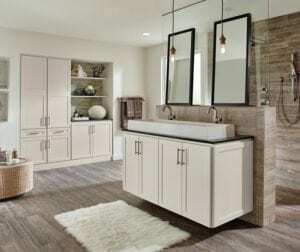 While replacing your bathroom cabinetry will require some cash, most homeowners are surprised at how affordable custom cabinetry can be, especially in smaller bathrooms. But, even if you have a larger bathroom, replacing your cabinetry is an investment that can increase the value of your home. According to Remodeling Magazine, homeowners can expect to recoup as much as 65.7% of the money they invest in a mid-range bathroom remodeling project. Plus, if you are planning to sell your home in the next few years, a bathroom with updated cabinetry is more likely to entice prospective buyers. As you can see, there are lots of reasons to consider replacing your bathroom cabinetry sooner rather than later. Replacing your bathroom cabinetry can be a great first step to a total bathroom remodeling project. But, it can also be the perfect solution to give your bathroom a much-needed facelift, especially if you don’t have the budget for a complete remodel right now. Whether you decide to remodel your whole bathroom or simply update your cabinetry, Red Rose Cabinetry is always here to help. Located in Lititz, PA, we’ve been working with homeowners throughout the Lancaster area for over 33 years. Stop by our showroom or visit our inspiration gallery to get some great ideas for your next bathroom project.